The Main Event of the France Poker Series Sunfest Cannes concluded with the victory of the Lithuanian Giedrius Gradeckas. This poker event held at Pullman Cannes Mandelieu Royal Casino recorded 559 entries including 207 during the Day 1A and 352 during the Day 1B. This field generated a prize pool of  536,640 shared between the 64 best players in the poker tournament. After the first two departure days, 205 players qualified for the Day 2n day during which those who acceded in the money were known. 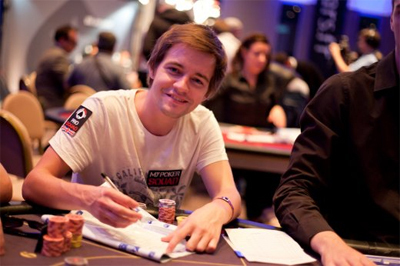 The elimination of Pawel Keller in the 65th place allowed the remaining players to finish in the ITM. Many well known players as Philippe Ktorza , Jean -Philippe Rohr, Guillaume Darcourt, Stephane Gerin or Antonin Teisseire were eliminated without being paid. 48 players were eliminated in the ITM and pocketed a minimum gain of  1,800: Erwann Pecheux, Guillaume Marshal, Guillaume Roiron, Stephan Gerin and Jonathan Barusta. At the end of the day, 16 players survived. At the end of the Day 3, the elimination of the remaining half of the field allowed Giedrius Gradeckas to reach the final table Yann Belkheir, Gregory Bultel, Julien Bauduin, Matthew Renoud, David Zakine, Michael Hugues and Tim Hartmann. The final table which guaranteed a minimum gain of  13,440 began with the elimination of Tim Hartmann in the 8th place, followed a few hands after by Michael Hugues (7th,  17,400). The elimination continued with that of David Zakine (6th,  22,800), the recent winner of the TV reality show La maison du bluff Matthieu Renoud (5th,  29,200), Julien Bauduin (4th,  36,200) and Gregory Bultel (3rd,  52,300). The heads-up between Giedrius Gradeckas and Yann Belkheir, turned to the advantage of the Lithuanian who pocketed  120,000 for his victory. Runner -up of the poker tournament, the French Yann Belkheir settled with  81,100.